New writing: Another of my articles has been posted at WhatMMO, 10 Common MMO Player Types. Which are you? Myself, I’d say I’m a Joe Average with a bit of the Talker, and occasionally the Helper if I’m in the right mood. Review: “Sanctuary for None, part two” Not surprisingly, the final episode of Sanctuary’s fourth season presents us with a doomsday scenario. SCIU, the government’s anti-Abnormal division, is planning the Abnormal Final Solution, a genocide that may not end even after the Abnormals are gone. Meanwhile, Caleb, leader of the Abnormal resistance, is planning to unleash a mutative agent so dastardly even Tesla thinks it’s crazy. Only Helen Magnus and her increasingly fractured team can stop these twin disasters, and time is, of course, rapidly running out. And so us viewers are treated to an epic struggle the likes of which we haven’t seen from this show since the final confrontation with the Cabal at the end of the first season. As this is is playing out, “Sanctuary for None” also hints at some vast scheme planned out by Magnus over her 113 year vacation following her trip back to the 19th century at the beginning of the season. This is one area where I wasn’t impressed with this episode, as it is never clearly explained what this incredible master plan is. The final scene shows its culmination, but to be honest, I’m still not sure what we were shown. Maybe I’m just dense, but I didn’t quite get it. Surely all will be revealed in the next season (if there is one; more on that later), but it would have been nicer for them to just come right out and explain what was going on. There are essentially two ways what we saw could be interpreted; one is incredibly awesome, and the other is very disappointing. But I don’t which is the truth, so I can’t really judge. My other complaint is the complaint I always have: needs more Tesla. Seriously, though, the few scenes he got in “Sanctuary for None” were excellent, even compared to his usual awesomeness, but there was the potential for a lot more. There’s a great little subplot of SCIU perverting his inventions into weapons of mass destruction, the news of which causes him to fly into a rage and illustrates that there actually is a good heart under all that arrogance and reckless brilliance. But sadly, this is not given anywhere near the attention it deserves. 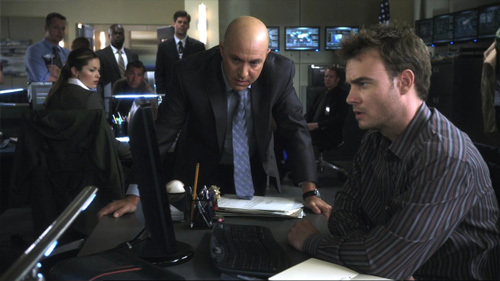 But despite those issues, I would still rate this as easily one of the finest Sanctuary episodes to date. It had all the action and suspense we’d expect from a season finale, and then some. There are serious “Holy ****!” moments in “Sanctuary for None,” and those aren’t something we get a lot of in this series. It also has plenty of plot twists, and hell, even Kate displayed some believable emotion for once. Thus concludes the fourth season of Sanctuary. As to whether there will be a fifth, no one can say, but from what I hear, the outlook is not good. The ratings are nothing to be impressed with, and from what I’m told, the fourth season was only grudgingly given the green light — hence its shortened length. Despite all its inconsistency and occasional mind-bending stupidity, I find the thought of no more Sanctuary surprisingly distressing. For all its stumbles, the last two seasons have had many more hits than misses. Besides, there’s hardly anything on TV I enjoy anymore, especially in the sci-fi department. If Sanctuary bites the dust, I may have to swallow my pride and start watching Doctor Who or something. 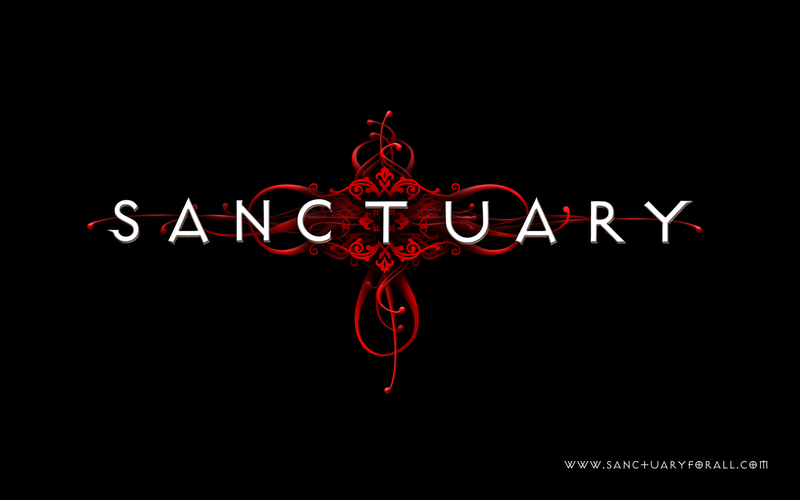 The first three seasons of Sanctuary are available on my Amazon Affiliate. Buy the DVDs and support the show. This entry was posted in Reviews and tagged fantasy, review, Sanctuary, sci-fi, TV, writing by Tyler F.M. Edwards. Bookmark the permalink.